While the video gaming industry prepares for a huge amount of news on future releases arriving at the E3 convention this time next week, the focus will be on the new consoles due to hit shelves by the end of the year, so with release dates for the Sony PlayStation 4 and Microsoft Xbox One likely to be revealed at the event, analysts who want to will seek to get their predictions on each product’s price in before that time. 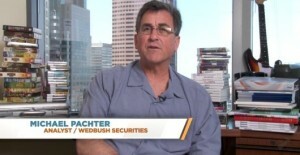 Michael Pachter of Wedbush Morgan (pictured) is one of those people, and he has this week arrived with the suggestion that adding to the long list of off-putting features that the Xbox One has so far, ‘higher price’ will be added to it, with an estimated $399 (£261) compared with the PS4’s $349 (£228). While he notes that the PS4 can also afford to be cheaper due to its cheaper ‘bill of materials’ estimate (around $275 (£419) compared with Microsoft’s hypothetical $325 (£213)), Pachter is of the belief that the Xbox One could be sold at a lower price on account of smartphone-style ‘subscription’ charges. This method would see Microsoft team up with any of the broadcasters or internet service providers that they work alongside to offer a combined console/service deal at a reduced rate for the hardware, in an effort to latch on to existing subscribers or attract new ones with an integrated deal. Speaking to GI.biz, Pachter stated: “We believe the ability to watch live TV from a cable, telco, or satellite set-top box through Xbox One could entice an MSO to drive subscriptions through a subsidised box in exchange for a multi-year contract. The ‘always connected’ requirement for the Xbox One likely means that a broadband connection will be required, suggesting to us that ISPs may have an incentive to offer a subsidy as well. A further prediction made was that existing hardware such as the PlayStation Vita and Nintendo Wii U could be forced into offering price cuts in order to keep up with the competition, which would be a fairly predictable direction to take considering the big names emerging, and while the PS4 and Xbox One could be cheaper than anticipated if Pachter’s figures are correct, will they have enough quality and ‘improvement’ on predecessors to justify whatever cost they choose? French video game publishers Ubisoft have announced the titles that will be on display for them at the E3 convention next week, and amongst them is the controversially-acquired role-playing game South Park: The Stick of Truth. Since gaining the rights to that Obsidian-developed title in January for $3.2b, the new official game of the animated comedy series has fought its corner with claims that they were sold on illegally from previous (now-defunct) rights holders THQ, although both parties appear to be in agreement now and pressing forward to a currently unspecified release date. That news, however, will most likely come during Ubisoft’s E3 appearance, where Stick of Truth will feature in Los Angeles (USA) alongside fellow upcoming titles such as Assassin’s Creed 4: Black Flag, Rayman Legends, Tom Clancy’s Splinter Cell Blacklist, and Watch Dogs. Starting the company’s participation at E3 will be an ‘invitation-only media briefing’ in the Los Angeles Theatre at 3:00pm PST on 10 June, giving updates on the Ubisoft lineup as well as announcing new games for future release. That event will be viewable online (live streamed or on-demand) via the Ubisoft YouTube channel, with all supporting game trailers also provided separately on the channel, while internal coverage is also planned through blogs and social media. Meanwhile, their attendance at the LA Convention Center will see them offer attendees ‘hands-on game time’ with a number of titles through their booth in the South Hall, featuring ‘special guests & live performances’, while members of the ‘Uplay’ service who sign up online in advance are able to be invited to the ‘Uplay Lounge’, a short distance from the E3 hall offering similar services alongside the chance to interact with ‘Ubisoft development team members’. With the current and next generations of game consoles to consider during the show, will Ubisoft be able to grab some headlines with a strong line-up of titles this year? 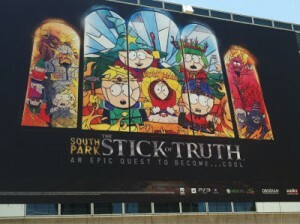 Meanwhile, South Park: The Stick of Truth (one of the trailers featured below) will have the rare ‘honour’ of appearing at E3 in two successive years, a feat they would rather have avoided had their partnership with THQ gone differently, but will they be able to match their previous show-stealing efforts the second time around? 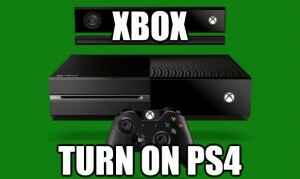 The recently-revealed Xbox One games console has so far been polarising opinion between ‘technological innovation’ and ‘AI will control my life’, though a latest rumour surrounding its development will probably fit more into the latter category, unless you are what is commonly referred to in gaming as an ‘achievement hunter’. 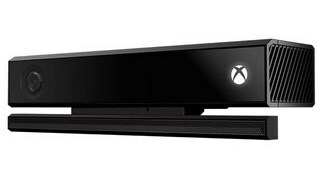 The new features, hinted by Gamesindustry International based on old Microsoft patents found, suggest that the product, through its ‘enhanced’ Kinect camera system (‘Kinect 2′), will be able to ‘monitor users’ content viewing habits’ through ‘a number of ways’. As an extension to both the ‘Achievements’ feature of the Xbox 360, and the ‘Xbox One TV’ connected viewing system of the next generation, Microsoft could offer Gamerscore-style points for viewing specific content and commercials. In addition, the patent relating to Kinect 2 also suggests that ‘DRM’ (digital rights management) measures will be tied to the motion-sensor in order to prevent people from cheating a content purchase system, and by ‘cheating’, we mean the heinous crime of having more people watching the video than its ‘purchase licence’ allows. However, it is believed by ‘industry sources’ that the ‘DRM system’ will become a part of Xbox One, presumably indicating a new ‘tiered licencing’ system for content based on the number of people watching it. With a console that is also ‘required’ to have connected to the internet at least ‘once every 24 hours’, and a new second-hand gaming sales system that will ensure Microsoft and game publishers make the majority profit from re-sales, is there any escape from the new Xbox for anyone who buys one, before the obvious inevitable happens? 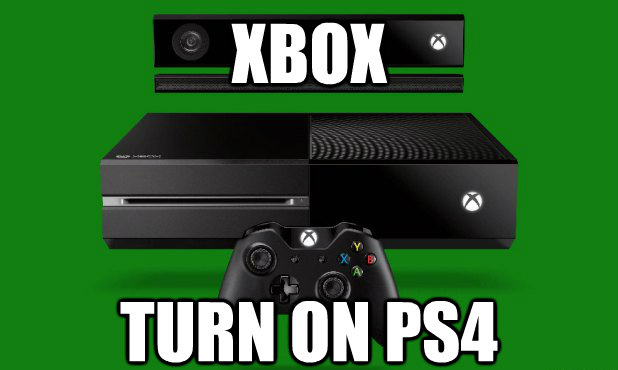 While the backlash from the reveal of the ‘Xbox One’ console continues (in which feedback from fans and industry experts remains still fairly negative, but not nearly as bad as it could have been), a revelation made the day after launch day could further alienate existing Xbox customers from the new device. Speaking to The Wall Street Journal, Microsoft’s Xbox division president Don Mattrick spoke out against any possibility of keeping the new console ‘backwards-compatible’, claiming that it is ‘backwards thinking’ to even consider just an idea. Despite many Xbox and/or Xbox 360 owners presumably having built up a collection of games for those consoles that would range in the hundreds or thousands of their currency, Mattrick stated his belief that only around 5% of such players would actually utilise such a feature and turn on old games, and as such it is not worth the time or effort to implement into the new console. It is noted, however, that while One will not support ‘games or accessories’ from the 360 or older systems, ‘non-game content’ such as video, movies, and music, will be transferrable, presumably either through external storage options or by an Xbox-sanctioned online transfer. Achievements and ‘gamerscore’ accumulated on the previous consoles will also be recognised and carried over to Xbox One. However, rumours are suggesting that Microsoft might not be alone on the issue, with rumours that main console rivals Sony, a company generally thoughtful of including such compatibility of their old system’s games onto the new, might not be carrying that feature on the PlayStation 4, but are rumoured to be looking into providing such games separately on the console via emulators and their cloud-game streamer service Gaikai. While the unveiling of the new Xbox console is undoubtedly the biggest technology story of the week, the planned integrated TV service for the Xbox One could be a big disappointment to many fans. It has been revealed by Microsoft that the TV feature will only be seen in the North American nation first before a ‘global launch over time’ for the service. 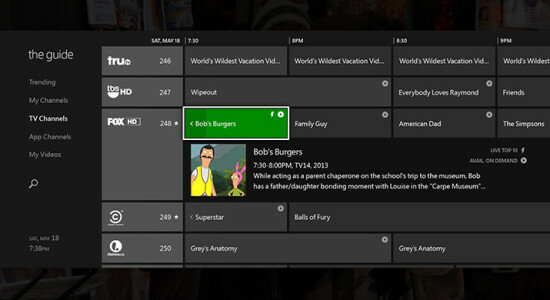 The ‘Xbox One TV’ system will enable owners of the console to synchronise it with their existing television setup (via a sold-separately ‘HDMI pass-through’) for a completely interactive EPG browsing experience (including Kinect voice/gesture commands as well as the new ‘snap’ overlay feature). While pinning their hopes on the Xbox One being an ‘all-in-one ultimate home entertainment system’, Microsoft are still claiming that games are an integral part of their machine, although given the current reaction to their console they may be placing their estimations a little too high with their prediction of ‘28% inter-generational growth’ for their Xbox division, believing that based on previous trends of games consoles, around 385m units could be sold by the time the 8th generation of consoles hits its peak in 2016. While it will be a few years before the company and analysts can determine if such a figure is ‘in the ballpark’, will market exclusivity of the TV add-on service in America boost key sales in their most important market, or is the lack of ‘instant globalisation’ going to see them start on the back foot when the new system is released? Making full use of the fact that their new console could pass in name for a TV channel, Microsoft have announced the first-ever piece of video content that will have its exclusive premiere to Xbox One owners, a live-action TV show based on one of the Xbox’s biggest breakout brands. Since the launch of the first version in 2001, the Halo video game series has become one of the most recognisable in the world, spawning several game sequels and spin-offs, along with branded comics and novelizations, but so far, in spite of many rumours, there has been relatively little video content stemming from official sources. 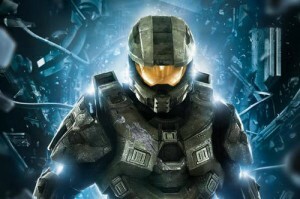 Adding to Xbox Live-exclusive ‘prequel’ mini-series Halo 4: Forward Unto Dawn, and anime series Halo Legends, a new unique series will be made in an effort to broaden the brand’s appeal, and have found one of the biggest possible names to help take the show there, with executive production coming from famed director Steven Spielberg. While Halo 4 game developers 343 Industries will be overseeing the creation of the project, it appears that an individual behind-the-scenes is bigger than the studio in this case, with Spielberg (director of film classics such as Jaws, E.T., and Indiana Jones, as well as being an executive producer on other notable titles such as Gremlins, Back to the Future, and Men In Black) finally getting the chance to work with the Halo brand for the first time since being rumoured to work on a cancelled Halo movie in 2009.